Eggless custard powder cookies, perfect for beginner bakers and even you can engage your kids making this cookies, pack for their snack box. Yay-yay-yay! I baked these biscuits for the first time and it came out very nice! My kiddo loves Jam biscuits a lot, I tried this especially for him and after tasting one he said ‘I love this’ ! !.Now I can bake cookies confidently as this attempt turned out to be a success! I saw this recipe at Divine taste blog ,when I was googling images for eggless cookies and got tempted and the recipe sounded pretty simple and I just went ahead and tried it,I didn’t changed anything,just blindly followed the recipe,as this is my first time,I dint want to take any risks. But I used ready made jam,while she has used her own home made jam. Soften butter and beat it until frothy along with powdered sugar and the essence. Add all purpose flour, custard powder, corn flour and curd. and make it into a smooth dough. Spread the dough in a flat surface using a rolling pin for about 5 mm thickness. You can see the image for reference,the biscuit wont rise much, so you can roll to the same thickness you want. Use cookie cutter of any shape and cut out the shapes. use the remaining dough and repeat the process. Arrange these biscuits in a baking tray lined properly(I used aluminium foil). I used the essence bottle’s lid for making a dent at the centre to fill the jam.Just a very very shallow dent.You can use your thumb too. Just fill a drop to cover the dent we have made in the biscuits..
Pre- heat oven at 180degrees C and bake the biscuits for 12 – 15 minutes(mine took 15 minutes) or until done. After cool down store in airtight containers and enjoy the home made Jam biscuits! The yellow colour in my biscuits are from the custard powder. Congrats dear..firsts are always special..they turned out perfect..!! Wow Raji..The recipe looks so yummy and the presentation is so cool….I am surely gonna try it soon..
Mouthwatering………..must give a try.Can we use instant pudding mix instead of custard powder? OOh! Those look amazing… Have to try! I love the custard taste too… Yummy!!!! I too love and add custard powder in few cookies as it enhances the taste and texture. You have done marvellous job raji.. They have come out beautifully..I know how much you all would have enjoyed 🙂 Keep going !!! it doesnt looks as if u have tried it for the first time.looks awesome. biscuits looks perfect and cute….gud job! Perfectly baked biscuits….addition of custard powder is interesting…am sure kids wud luv it at first look! Those look really good!! And eggless too – I'm going to give this a try for sure. It has come out perfect and crisp. Must try it atleast once. very nice . i will try this. i make idli as per your instructions and it was really soft. Where i can get measuring cups like u in singapore? and pls post recipe for curd rice like they serve in komalas and tamarind rice like in temples here. We love that but dont know how to make. Such tempting biscuits Raks. Superb. perfect jam cookies. I generally use the thumb but love your idea of using bottle cap. looks very neat. AparnaThanks for the feedback and nice words! And for the temple style tamarind rice,here I have not tasted tamarind rice here,but I know temples always serve divine tasting rice,I will try and post,mean while you can also refer my Puliyogare post. Wowww… looks sooo cute and delicious.. very nice presentation dear.. awesome job !! beautiful and yummy jam biscuits…they look very perfect and I'm tempted to grab a few..
awesome recipe..nice clicks..looks so yummy!! Is there a super-like to posts??? If so I can click the same about a hundred likes!!! They look beautiful now wonder your son was so happy with them, i love jam cookies too, i can't stop with one though. Cute looking and scrumptious cookies..
Biscuits look great and lovely. Can't believe it's first time. They came out so perfect !! Love the color and flavors !! Good one Raji !! Its been ages since i saw a Jam biscuit!!! i am drooling. wounderfull dear,luks perfect…asusual fantastic pics. Looks so cute and delicious, they came out perfect..
lovely biscuits..never used custard powder in cookies.Tempting recipe! I love it too. You are becoming a pro in baking. Way to go Raks. For the first try itself it has come out so perfect and looks awesome. those are lovely biscuits. Perfectly baked and Yum! Congrats for your success Raji! 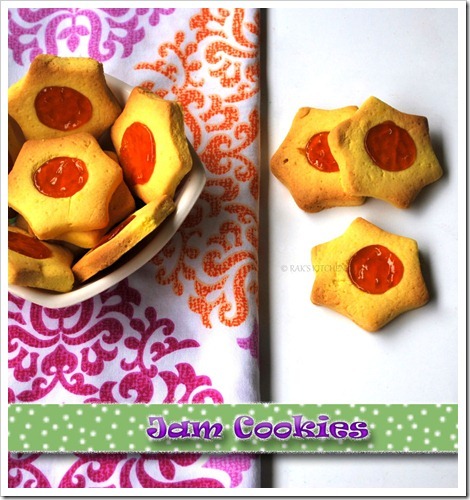 Eggless jam biscuits look great and tempting!! Did you used the same Microwave convection mode for baking this.. I wish it will be nice if u post any new kids recipes apart from what is already posted..I have a four year play boy and six months sweetie girly pie…I will be happy if you add any new lunch box recipes which are healthy and yummy…awaiting for your new posts…thanks alot for your wonderful recipes..
Hi i tried this one and it turned out really well. I was really happy about it. I have a small doubt, can you please tell me what does half cup butter mean how many grams is it approximately. Can you please tell that. Hi i tried this and it really came out well.Thank u so much. Hi, this was a really nice recipe. Can you please guide me with substitutions if I want to make a chocolate version uising cocoa powder? You can use 2 tblsp cocoa power in place of corn flour. Reduc corn flour to 2 tablespoon as well. Just a guess. Should come out good. Very nice..tempting ..gonna try soon..
Have a doubt..Whenever u call for butter in a recipe, should we take it as unsalted butter or can we use salted also..Because I'll take something named butter while purchasing, never worrying whether its salted or unsalted..Which is good to use?? can i know if we dont have Oven What should we do…. biscuits are very nice. can these biscuits baked in microwave oven? coz i have normal daewoo touch microowave oven. what are the things we can bake in this type of oven. can you suggest? If you have convection mode in ur oven you can, not in microwave mode. Texture may vary. You may not be able to shape it first. From where u got that cookie press mould? Hi I am a beginner for baking and have a small query.hope the ingredient corn flour you have mentioned is corn starch right?